Complete H-alpha Solar Telescope with 152mm aperture and <0.65 Angstrom bandwidth. With Feather Touch focuser, new air-pressure tuning system and B1200 Blocking Filter. The large LS152THa is sure to provide a professional balance of resolution and performance! 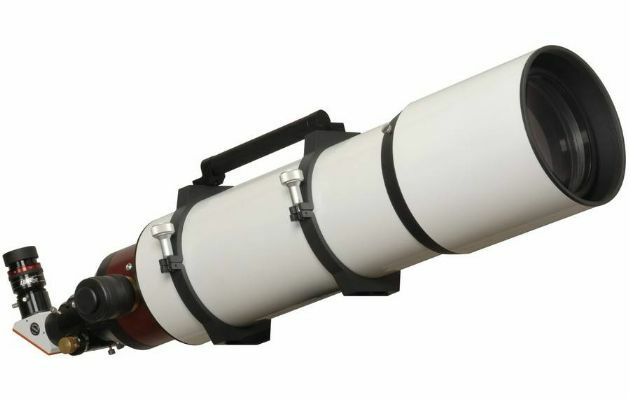 This large solar telescope is perfect for the ambitious solar observer! If it's a perfect image you're after, the LS152THa provides a very large and high resolution image size. The 100% unobstructed system will perform to the highest level at both low and high magnifications. Utilizing both advanced hi-contrast coatings, and the new Doppler True Pressure Tuning system, the user will be able to experience crisp, sharp, high magnification visual images, as well as utilize this system for high end digital processes. An internal etalon with new air-pressure tuning adjustment allows for a <0.65 Angstrom bandwidth. This "Pressure Tuner" system allows a better Etalon adjustment than other systems. The “Pressure Tuner” system adapted the Etalon to varying altitudes and atmospheric pressures for always optimal performance. The extension tube in which the blocking filter is installed, is equipped as standard for 2" eyepieces and with a adapter for 1.25" eyepieces. Focusing is achieved with a high precision Starlight Instruments 2" Feather Touch focuser with 10:1 reduction as standard equipment. A refractor based system with a 152mm front objective. An unobsructed internal HD Etalon with the new Pressure Tuner allows for <0.65 Angstrom bandwidth, providing slightly higher surface detail without the loss of edge detail. The system includes the moutning rings and dovetail, dust caps, and is delivered in an Aluminum re-enforced case. A Lunt Zoom eyepiece is included. Also available for the system is an optional, interchangeable, CaK module allowing for the research of multiple wavelengths thru the same platform.